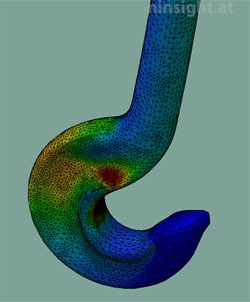 Analytical surface representation of a hook. To achieve the highest possible accuracy during numerical simulations, we are using high-end analytical surface modeling. 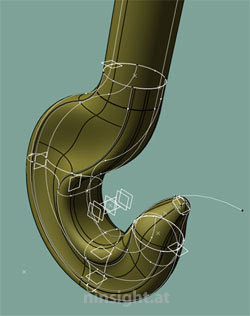 This is based on techniques such as NURBS and Subdivision surfaces, which allow to capture all geometrical details of the design (such as curvature and continuity) up to any desired level of accuracy. Von Mises stress in an adaptively refined hook. During the finite-element simulation, special techniques help to take advantage of the analytical surface description: (i) error estimation is used to generate adaptively refined meshes. (ii) If contact occurs between two bodies, the original analytical surface is used as an overlay element in the finite-element description to enforce the contact constraint. With this strategy it is possible to obtain results with the best possible accuracy. This is not possible, for example, if the mesh refinement is based on a rough original finite-element discretization (as opposed to an analytical surface description). In the present application we have studied a hook, which is not trivial to describe by smooth surfaces and takes a lot of advantage of the applied adaptive mesh refinement strategy.